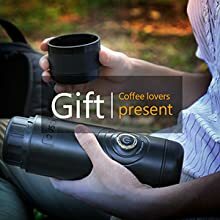 EFFICIENT & PRACTICAL – Operated by rechargeable lithium battery and heating up water rapidly makes it to be the genuine travel espresso maker and you can enjoy your coffee experience anywhere to satisfy your coffee needs anytime. HIGH PRESSURE PUMP - Up to 15 bar high-pressure pump allows for a barista-style result, unlocking the delicate flavor and premium aromas of coffee capsule during the brewing process and creating an incomparably dense and unctuous crema. 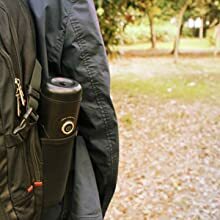 TRAVEL TO GO - With streamlined and compact design, it can be placed in easily in a cup holder or bottle holder in a backpack so it will be your perfect addition when you have outdoor actions, such as hiking camping fishing hunting etc. CAPSULE COMPATIBILITY - Only use genuine Originaline Nespresso Capsules instead of Nespresso compatible capsules. Only use genuine OriginalLine Nespresso capsules instead of compatible ones. Piercing needles would not puncture the foil quite enough if you use other brand's pod. What's worse, it may bend needles. To get warmer coffee, please run this machine using hot water without a capsule inserted to pre-heat the unit. To speed up the process, please use boiled water to make espresso as far as possible when you are indoors. CISNO Portable Espresso maker is an original creation, made and tested with the greatest care to meet the standards. 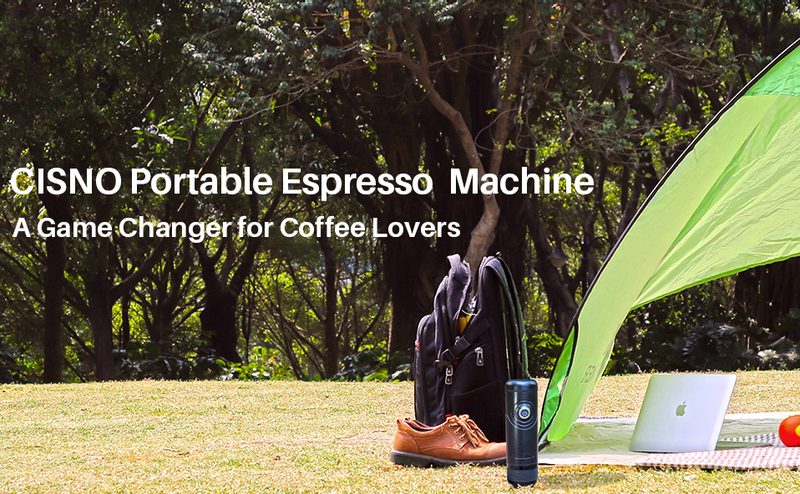 At the push of a button, you can have a perfectly extracted espresso anywhere. Produce the same authentic flavor as a commercial espresso machine with the 15 bar pump pressure. 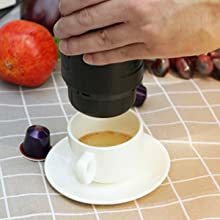 This pump-driven espresso machine is a travel cup in one. 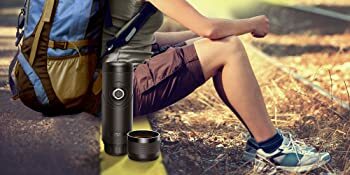 It is a must-have gadget for camping, hiking and business trip thanks to the shorter, more bullet-like shape, and the ability to place it easily in a cup holder or bottle holder in a backpack. 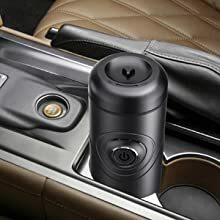 It comes with a 12V car charger, so the machine can be electrified by the vehicle power supply with or without the battery inside the machine. This CISNO automated espresso machine will be a desired gift for those coffee lovers who travel a lot and it will get his or her regular caffeine fix. Why do you need an extra battery or a power converter? If you are a coffee addict, you would possibly lose track of how many cups of coffee you have had. 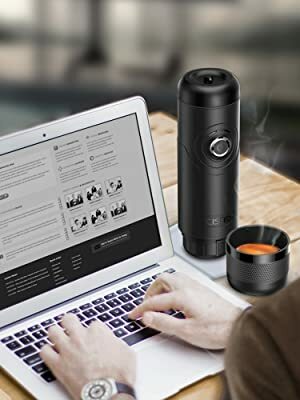 When you are out of town and caffeine hits you, you can continue brewing a hot cup of coffee and refresh yourself immediately. 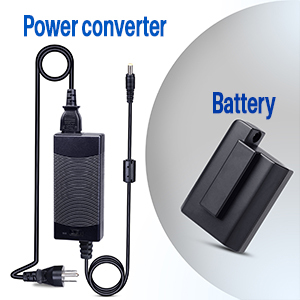 Unlike the AC adapter that comes with the machine, this power converter can be used to charge the battery pack, or to heat and pump the coffee. This can also occur without the battery in the machine. If you go aboard with this machine, the battery must be dismantled and stored separately. The package comes with a AC adapter instead of a power converter. Accessories are shipped to US Only at the moment. Crystal Ceiling Fans Blade are Retractable and Fold-able, Diameter 42 1/2" when extended and 21" when closed. Led Ceiling Fan Light Has 3 Dimmable Light: White , Warm, Neutral Light, you can easily control them. This Modern Flush Mount Ceiling Fan includes the Remote, you can control the fan and lighting independently and easily.